From the family of smear-ripened or washed-rind cheeses, Limburger is practically made to pair with beer. The bold flavor of the orange-colored, slightly sweet and acidic rind and the smooth, creamy texture of the paste blend well with the effervescent, cool taste of a pint. Limburger has long been considered a working-class cheese, because it packs a lot of flavor for not a lot of money. The cheese with its dense meaty texture is strong enough to hold its own on a rye-bread sandwich with red onion and mustard and to equally satisfy the tastebuds. Often found on bar menus and under glass at the deli counter, this Belgian-German cheese has become an American classic. On a balmy February evening, cheesemongers Eric Paul, David Doughan, and Alifair Skebe met to sample Limburger and Beers, looking for the perfect pairing. A great pairing will bring out the best in both, and particularly for Limburger, you want the sweetness and subtlety of its hearty, bold flavor to shine above the funkiness of the washed rind. The right beer can do just that. The wrong beer will either leave the cheese tasting flat or overpowering. Of the beers that night, we sampled Belgian beers and the American Peak IPA. Amongst the Belgian contenders were Duvel, Chimay blue label, Lindeman’s Gueuze Cuvee Rene, and Delirium Tremens. Although Limburger has long been thought to be a German cheese, its origins are located in Belgium with the monasteries, and its roots are close to Chimay. Thusly, we chose to pair it with the beers that most resemble its heritage. The tasting order of the pairing began with Peak Organic IPA, and American Indian Pale Ale, and moved to Delerium Tremens and Duvel, both Belgian strong pale ales. We then tasted Lindeman’s Gueuze Cuvee Rene, a Belgian sour, and finished with the Chimay Grande Reserve blue label, a Belgian strong dark ale. Bright yellow. One finger head. Crisp, refreshing IPA that has not gone overboard on the hops. I definitely would drink this IPA on a regular basis; however, the Limburger overwhelmed the crisp taste immediately. Water might be a better pairing than this IPA. The worst pairing of the night. Bright yellow hue with no clouding. Nice lacing. Very little head. Aromas of cloves and pepper. Taste is a bit sweet at first followed by some heat and ends with a dry finish. The better of the two Belgian Pale Ales. Almost able to stand up to the Limburger. But the cheese wins out on the finish. Bright yellow hue with no clouding. Moderate head. Very slight lacing. Taste is more linear than the Tremens. Crisp spicy taste then just goes nowhere after that. The Duvel just is not as interesting a BPA. Once I tasted the rind of the Limburger I could no longer taste the beer. The beer did hold up to the paste though. Hazy orange hue. Slightly more lacing than the Belgian Pale Ale. Barnyard aroma with tart overtones. Taste – tart/sour but not overly aggressive. Some spice in the background, but I could not place it. Well-balanced. Amber to brown color. 2 finger head. Aromas of plum and other fruits. Red wine tastes abound – grape, plums, raisins come to mind. Very sweet. Creamy texture. The only beer that worked with the Limburger without accompaniments. The sweetness of the beer was able to soften the acidic flavor of the rind and allowed me to really enjoy the fruity undertones of the Limburger’s paste. Overall we found that we enjoyed the Limburger especially when eaten with rye bread and condiments. 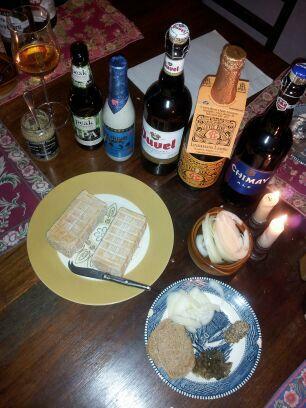 We agreed that the best Limburger pairing of the evening was Chimay. The flavors enhanced one another and brought out pleasant notes in each. Eric also enjoyed the Delirium Tremens and Alifair liked the Lindemans. The order of beers was wrong…drinking the Gueuze before the Belgian Strong Pale Ale killed the palate.